There are many considerations to think about when we contemplate the changes that will occur in the next decade and what our students will need to be successful in that time-frame and beyond. Many are advocating for transforming our educational system to accommodate the needs that are foreseen. In light of that, thoughtful discussion surrounding all of the considerations needs to happen and include all stakeholders. Given there are so many facets to consider, I found it helpful to break down the constituent parts in my own mind, thus this series: The A, B, Cs (and X, Y, Zs) of the Class of 2030. For the inaugural post, I contemplated many concepts: attitude, aptitude, achievement; but I finally settled on access as I feel all the rest hinge on it. What is worth knowing in the “Age of Siri?”? ... What knowledge and skills, should the “Class of 2030” have? Does the modern graduate leave school with a set of skills and knowledge necessary to access the middle class through a well-paying job? Does the modern graduate leave school with the knowledge and skills to be a productive member of our democracy? Does the modern graduate leave school with the problem solving and critical thinking skills necessary to solve complex problems? Our system must be able to assure that every student graduates with the skills necessary for modern 21st century literacy: the ability to be fluent with technology, the ability to make cross cultural connections, the ability to work collectively, the ability to understand and synthesize multiple sources of information, and the ability to respond in an ethical manner to our complex environment (NCTE, 2013). In order to accomplish any of these things, we must first address the issues surrounding access. More and more being able to be a productive member of society involves access to technology and the internet. Take two areas that are elementary to being a productive, involved citizen: working and voting. Let's first think about the process of job hunting. Job boards are online, employers are moving towards automated application systems, and require digital submission of resumes. Even many low-paying jobs require the potential employee to complete online applications and aptitude questionnaires. Now consider the democratic process. Registration and voting itself are heading more and more towards technological solutions thereby requiring technological access. If we are to arm our students with the skills necessary to navigate their world and be productive in the future, we need to ensure access now. It is extraordinarily difficult to be fluent with technology if it is unavailable. 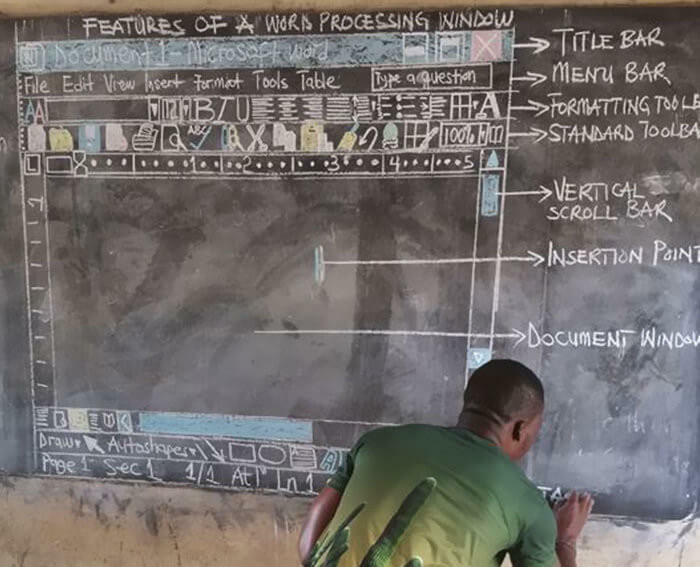 Consider Owura Kwadwo Hottish, an ICT teacher from M/A Junior High School in Kumasi, Ghana; he teaches his students computer courses and he does it without access to a PC. And we do not have to go far afield to find access issues and a widening digital divide. We can look right next door. • The Pew Research Center found that 5 million households with school-age children do not have broadband access. Low-income families make up a heavy share of those households. • According to the Bill & Melinda Gates Foundation, 42% of teachers reported that their students lack sufficient access to technology outside of the classroom. • Results from CoSN’s 2016 Annual Infrastructure Survey show that 75% of district technology leaders ranked addressing the lack of broadband access outside of school as a “very important” or “important” issue for their district to address. Digital equity—equitable access to essential technology resources for educational and economic opportunity and civic engagement—is rapidly becoming a prerequisite for economic and educational opportunity and justice. Schrum masterfully underscores how access is paramount to achievement of every kind for the Class of 2030, and while the preceding information may seem disheartening, I am hopeful for many reasons. First and foremost, a commitment like Owura Kwadwo Hottish shows in ensuring his students receive the best education he can provide is not an isolated incident. It doesn't take long to find innovative, caring educators who work diligently to provide 21st-century learning to their students. The Teacher's on Fire Podcast highlights many inspiring educators as does VoicEd Radio. Secondly, initiatives spearheaded by communities, school boards, and individuals are addressing the issues highlighted previously. For example, in the Columbia Basin Region, The Community Technology Program helps create tech-enabled spaces where residents can access technology to explore, connect and create in the digital world. They provide funding and support to increase opportunities including access to 3D printers, robotics kits, recording studio equipment, and computers with specialized software. Communities are joined by school boards in the race to support equity of access. For instance, a number of districts in the United States have been very creative in increasing access for all. Some have made wi-fi available on their buses so that students are able to do homework on their ride to and from home. They also park the busses overnight in neighborhoods where internet access is not otherwise available (McCrea, 2015). Yet others broadcast their Wi-Fi for the community when school is not in session (Schrum). Finally, a project spearheaded by an individual is Computers4Change, a charity started by educator Lee Martin. It is an exemplary enterprise which seeks to provide greater access to educational technology for students and educators. Finally, it is encouraging to see businesses do their part in creating solutions. A number of examples exist like Microsoft's program giving free access to Office 365 to students and educators. Google has partnered with various school districts on a number of programs. A case in point is the Dynamic Learning Project, which embeds technology coaches to help empower educators with the skills, tools, and training they need (Schrum). Countless examples exist displaying the ingenuity and drive of people, school boards, communities, and corporations to ensure equity of access. I hear of new innovative initiatives every day and this gives me great hope that we will keep working to ensure that the Class of 2030 and every class has the tools, skills, and support they need to succeed. Colwell, Chris. “Educating the Class of 2030.” School Law | National School Boards Association, National School Board Association, Feb. 2017, Accessed 13 Feb 2019. www.nsba.org/newsroom/american-school-board-journal/asbj-february-2017/educating-class-2030. Jeffrey, Cal. “Ghana ICT Teacher Instructs Students in Low-Tech Style.” TechSpot, TechSpot, 1 Mar. 2018, Accessed 13 Feb 2019. www.techspot.com/news/73520-ghana-ict-teacher-instructs-students-low-tech-style.html. Schrum, Lynne. Learning Supercharged: Digital Age Strategies and Insights from the EdTech Frontier. ISTE. Kindle Edition.